My Home Life (MHL) Germany was officially launched at a National Care Home R&D Forum (NCHRDF) meeting hosted by University of the West of Scotland (UWS) last month. 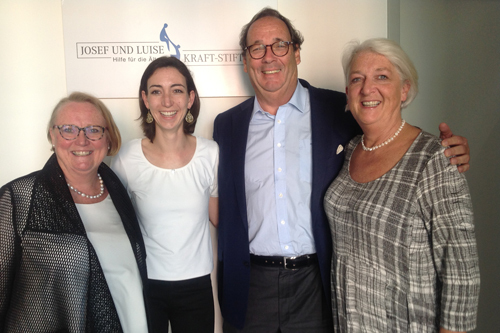 The Josef und Luise-Kraft Foundation will take forward My Home Life in Germany. The Foundation promotes human rights in care and sees the MHL Leadership Support programme as a vehicle to address human rights in German care homes. In April, the MHL England Director, Professor Julienne Meyer CBE and the MHL Scotland Director, Professor Belinda Dewar OBE of UWS, visited the Foundation in Munich to share the learning to date from the MHL Leadership Support programme, which has led to the launch of MHL in Germany. My Home Life was launched in 2006 by Help the Aged (now Age UK) in partnership with City, University of London to promote quality of life for those living, dying, visiting and working in care homes. Starting in England, the MHL vision of best practice resonated and quickly spread across the UK and most recently further afield into Australia and now Germany. The associated MHL Leadership Support programme sets out to support managers to develop as appreciative inquirers to create and sustain evidence-informed, relationship-centred and appreciative cultures in their care settings. The programme has been further developed, by sharing learning across national borders. “We are delighted to have launched My Home Life in Germany. This is a hugely important development as we work to spread and continually develop care home best practice not just in the UK but globally. “We believe that relationships are key to the delivery of person-centred care. This means that we must not only consider the needs of older people in care homes, but also the needs of relatives who visit and the needs of staff who work there. To enhance connections, we focus on having caring conversations; because we believe that relationships depend on the way we talk to one another. MHL Germany was officially launched at a NCHRDF seminar at UWS on 25 May 2017. The Forum was established in 2003 to provide a platform for researchers and practitioners to network, share information and ideas arising from their work.